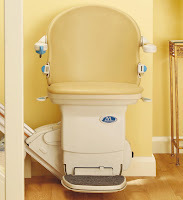 Castle Comfort Stairlifts offers top brand stairlifts, keen prices and fast installs for all those seeking stairlifts in Cork, Kerry and Limerick. Give us a call today by going direct to our Cork stairlifts rep on 021 236 3222.If you are looking for fascinating facts about the area then feel free to read on. 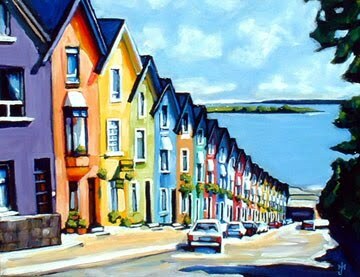 Cork is a county in the Irish republic and is also the name of it's county town, now the city of Cork. The city is Irelan d's 2nd city after Dublin and aswell as being the European capital of culture in 2005, it was named as one of the top 3 cities to visit in 2010 by Lonely Planet travel guides. It's a far cry from its early origins as its name comes from the Gaelic word "corcach" which means "the swamp!" It has a busy harbour with ferries to the UK and further afield. It has recently started a ferry service to Swansea where we also have another of our stairlifts offices and surprisingly one of Corks twin towns is Swansea along with Cologne, Coventry, Rennes, San Fransisco, Shanghai and Kaliningrad. Home to the worlds oldest yacht club the harbour has seen many of the 6 million emigrants leaving Ireland for a better life in America on assisted passages. 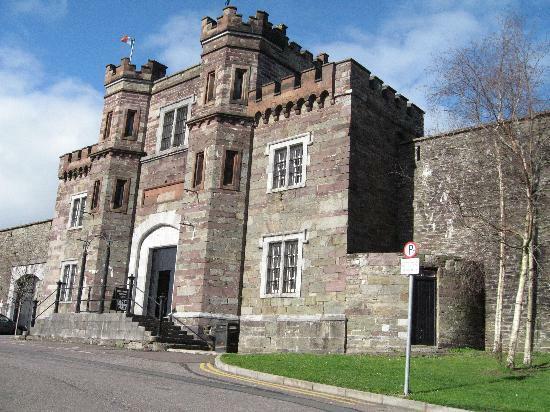 Nearby Spike Island was home to others who were emigrating, though not of their own choice. They were off to the penal colonies in Australia. Nearby Cobh (pictured) was the last port of call for ships sailing to America and was also where the Titanic made its last stop before its ill-fated journey across the Atlantic. 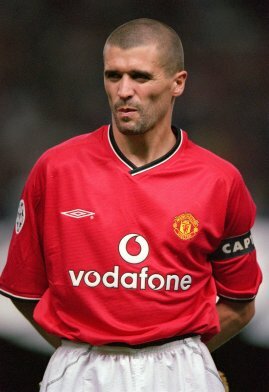 Two famous sportsmen from Cobh include ex-Man Utd captain Roy Keane who started his football career as a schoolboy for Cobh Ramblers, aswell as current Aston Villa player Stephen Ireland. Hurling and Gaelic Football are the most popular spectator sports in the county and Cork County team is a very successful Hurling club having won 30 All-Ireland Championships. 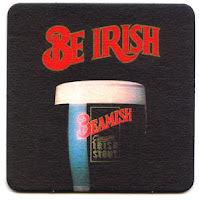 Industries in the city include the breweries that make Beamish and Murphys stouts and it is also where Pfizer manufacture Viagra. It is a popular shopping attraction with its two main precincts being the St.Patricks Street and English Market areas. One of the greatest landmarks in the county thats been visited by millions of people worldwide is Blarney Castle which is home to the Blarney stone. It is said that if you kiss the stone it will give the gift of eloquence. It is also the origin of the phrase "a load of old blarney," which is flattery and nonsense talk. Something that an unscrupulous stairlift salesmen might employ - so be on your guard and for our advice on how to deal with them see our stairlift spam blog. 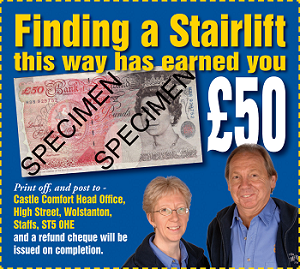 Are you asking if stairlift prices are monstrous? Not from us they aren't. Just click on Keiths nose. The wider county is famous for its hill walking scenery and also whale watching on the coast. The county borders Kerry and Limerick to the north and Tipperary and Waterford to the east. 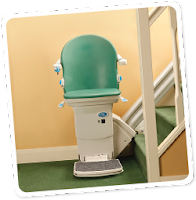 These are all areas to which our stairlifts engineers can visit to measure you up for your lift or even to do stairlift repairs and servicing if you require it. Notable residents of Cork and Cobh include the following. Anne E. Ball (1808–1872) and Mary Ball, (born Cobh, 15 Feb 1812), sisters who were pioneering scientists motivated by curiosity who contributed to the knowledge of Irish flora and fauna. They are noted as eminent scientists in the history of phycology. Robert Ball, (born 1 April 1802, died 1857). Brother of Anne and Mary Ball. Zoologist. 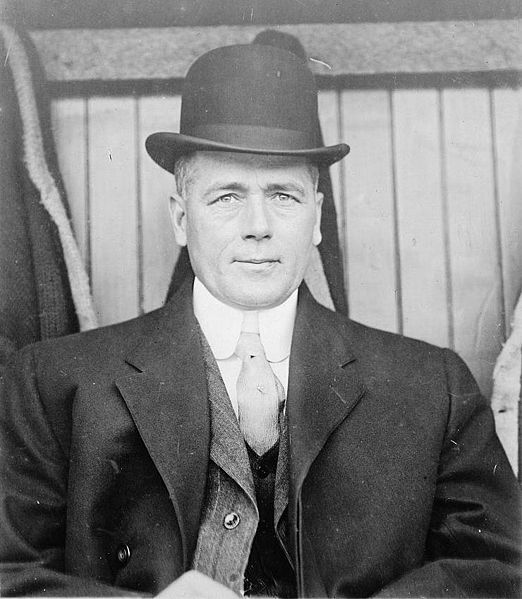 Captain Thomas Brierley, awarded a medal for outstanding gallantry for his heroic part in the rescue of Lusitania victims. Charles Guilfoyle Doran - Fenian and Clerk of Works throughout the building of Cobh Cathedral. Lived in the town most of his life. Patrick Walsh (bishop) Emeritus bishop of Down and Connor was originally from here.